Think about a time that you went to a friend’s house and they brought you down to their basement. Perhaps it was to hang out or to help them get something out of storage. No matter the reason, one thing that sticks out in your memory is the smell; that damp, mildew smell most basements have. Crawl spaces can be even worse! As a result, most people don’t want to spend much time in even the nicest of basements because of how unpleasant it can be to the senses. Yet, there is a simple way to transform that damp feeling and mildew smell into something fresh! Simply adding a crawl space dehumidifier to your basement can do wonders. Whether your basement is where you go to be alone or where you store your belongings, a basement dehumidifier can revolutionize the way that you see it (and smell it!). On this list, I’m going to rank The Soothing Air’s very best fifty-pint dehumidifiers and explain why they are where they are. Considering that below the house can be one of the most difficult places to keep a dehumidifier consistently working, any one of our top choices would be the best crawl space dehumidifier. How to Determine the Right Dehumidifier Capacity? Throughout the several years that The Soothing Air has been reporting, we’ve tested and retested multiple dehumidifiers. By doing this, we hope to give potential consumers the very best information regarding the top products on the market today. Your happiness and comfort is important to us which is why we work so hard to give you the best information possible. Our goal is to get you to buy the best product that suits your individual needs; we’ve done our research so you don’t have to. We aren’t being paid to promote any specific product nor were we asked to by anyone. We compiled this list using the utmost integrity. Whether it’s a dehumidifier for your crawl space or basement, you can rest assured that the products on our list are of the best quality and we discovered that using our own hands. Keep this in mind as we list our considerations for the most effective crawl space dehumidifiers on the market today. When choosing a dehumidifier, size does matter. Not the actual size of the dehumidifier itself but the capacity of moisture it can take out of the air in a 24-hour period. There is a certain size dehumidifier that would work best for your needs depending on what climate you live in and what area of the house you need to dehumidify. There are a few different types of dehumidifiers that vary in how much water they can take from the air every day. These include compressor-based, thermos-electric, and desiccant dehumidifiers. A compressor-based dehumidifier can cover larger areas and extract more moisture from the air than other types of dehumidifiers. I recommend a compressor-based as this will meet most people’s needs when it comes to dehumidifiers. Before choosing a dehumidifier, you should first evaluate your home or area. Check the dampness of the walls and floors. Look for visible signs of damage, mold, mildew. The corners and edges are the first places to look. Then, measure the square footage of the area. These factors are very important for selecting the right dehumidifier for your needs. For moderately damp conditions in your home or basement or a slight moldy smell during humid days, you will need a dehumidifier that can withdraw 10 pints (4.73 liters) of water from 500 square feet. For every additional 500 square feet, add 4 pints (1.89 liters) to the necessary capacity for the dehumidifier. For example, if an area is 1500 square feet, you will need a dehumidifier that can remove 18 pints (8.51 liters) of water. For very damp conditions, you will need a dehumidifier that can extract 12 pints (5.67 liters) of water for 500 square feet. Also for these conditions, add 5 pints of capacity needed for every 500 square feet. 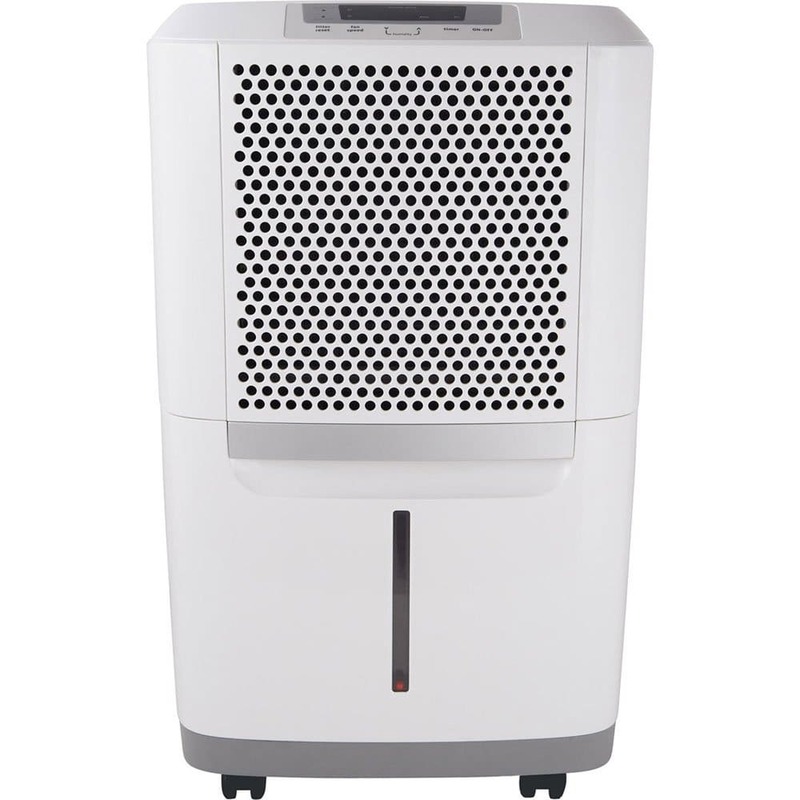 This size dehumidifier is also good if you have damp areas or mildew stains on the walls of your home or basement. For wet conditions that have visible leaky conditions from wet or seeping foundations, you need a dehumidifier that can collect 14 pints (6.62) of water within a 24-hour period for every 500 square feet. If your square footage is larger, add 6 pints (2.83) for every additional 500 square feet. For extremely wet or humid conditions, you need a dehumidifier that can extract 16 pints (7.57 liters) of water from the air within 500 square feet. Add 7 pints (3.31) for every extra 500 square feet. The next aspect of a dehumidifier to consider is the ACH (air changes per hour). This tells you how many times the fan will pull the air through the dehumidifier each hour. The ACH helps determine the airflow needed to fully dehumidify your space. Extremely wet conditions have humidity levels between 90-100%. You can sometimes see puddles from standing water or seepage. The needed ACH of a dehumidifier for this type of environment is 6. Wet conditions have 80-90% humidity levels. There could be water stains, wet spots, mold, or mildew. For this, the suggested ACH is 5. Very damp conditions have humidity levels between 70-80%. The walls will sweat or show moisture. There could also be a mildew smell in the area. The ACH for this environment is 4. For damp conditions, humidity levels are between 60-70%. The area will feel damp and smell a little musty in humid weather. This is typical for a normal basement of crawlspace, and the recommended ACH is 3. The next part to consider when choosing a dehumidifier is the CFM (cubic feet per minute). This measures the cubic feet or air the dehumidifier pulls in every minute. This is important to factor in as square footage of an area does not include the height of the ceilings. Humidifiers with higher CFMs can pull air from larger distances around the dehumidifiers, which is important for larger areas. To measure the right CFM for your room, multiply the ACH value you’ve found by its cubic square feet and then divide the result by 60 mins. What is a 50-pint Dehumidifier? 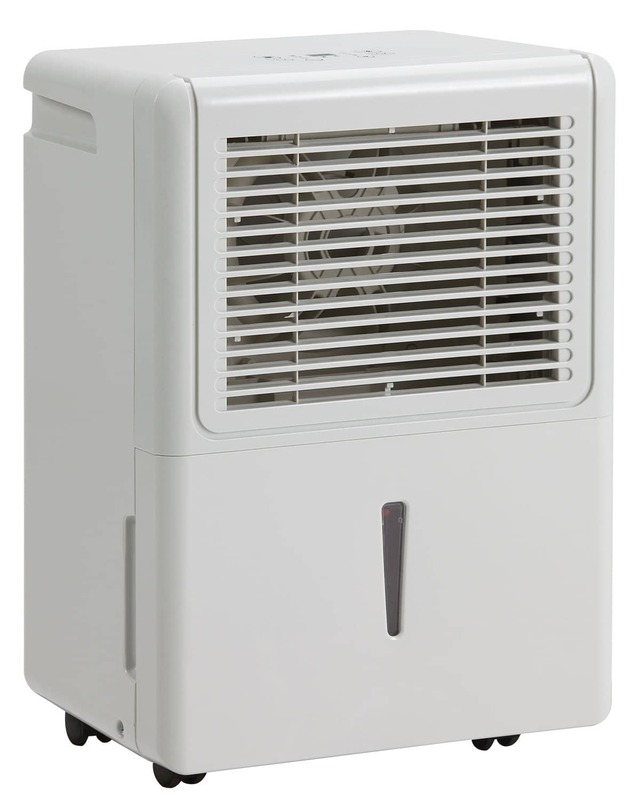 50-pint dehumidifiers are a great option for the average consumer for several reasons. They get their name from the simple fact that they can remove up to 50-pints of moisture from the air in a 24-hour period. Although that’s considered mid-sized (with small being 30-pint and larger being 70-pint) it’s more than enough for the average household. They can cover anywhere from 800 to 3000 square feet which is plenty for most residential basements and crawlspaces. With streamlined features that make them even more convenient, most dehumidifiers today have user-friendly digital displays and programmable settings. Unfortunately, some dehumidifiers consume far too much energy. To get the best quality and energy conservation, always look for a dehumidifier with an “Energy Star” rating. This rating is granted after running tests on an electronic product and indicates that it uses an appropriate amount of energy. The very best dehumidifiers that we encountered made it into our top-rated list of 50-pint dehumidifiers. The dehumidifier that best fits your specific needs is dependent on the size of the room you want to place it in and how humid the room itself is. For example, high humidity spaces such as a crawl space or basement require a larger dehumidifier with a high level of moisture capacity. On the other hand, a small bedroom would be fine with a lower capacity dehumidifier. Whether or not a dehumidifier needs a pump is also an important factor that we considered in our review. When you’re shopping for a smaller dehumidifier, the temperature of the room you’re putting it in is an important factor to consider. These kinds of humidifiers often have very little in the way of temperature control and rely heavily on the conditions of the room. If an area’s temperature range is too extreme, like a garage, then the dehumidifier best suited for your needs may be a larger one with better control. If you put a small dehumidifier in a place where it can’t handle the temperatures, the refrigerated coils are likely to freeze up. So, the best crawl space dehumidifier is not going to be a smaller model. 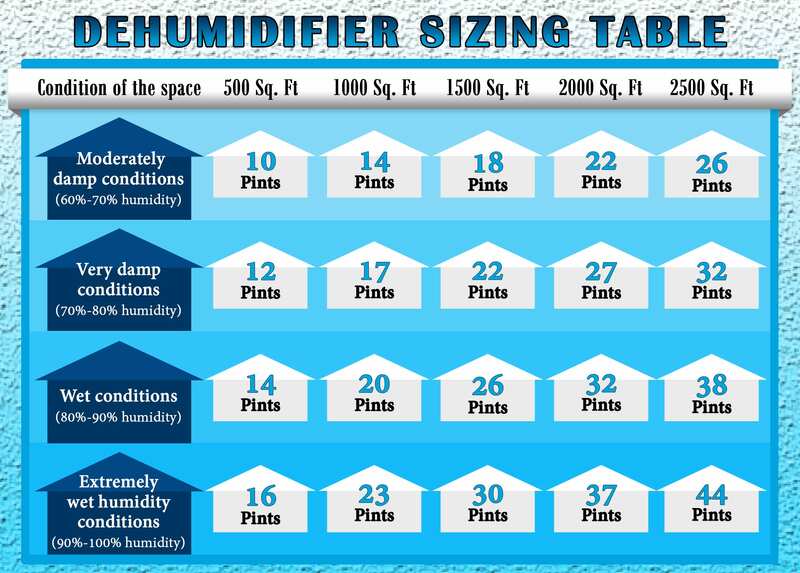 When choosing the very best 50-pint dehumidifier, keep in mind the room size. The dampness of the room and the capacity of the dehumidifier are also important factors to consider but possibly the factor most shoppers are concerned with is price. No one wants to waste money on a 70-pint dehumidifier when a 50-pint dehumidifier will do the job just fine. Something important to remember when purchasing a dehumidifier is that there are 8 pints in a gallon and pints are what they measure dehumidifier capacity in. Also, a pump is another option to consider when purchasing the best product. A crawl space dehumidifier is best paired with a pump because it’s much lower maintenance than one without a pump. The dehumidifier with a pump will often cost a bit more but will pump the moisture out into a different area so you don’t have to take care of it. If you don’t mind a little extra work, a dehumidifier without a pump fills a small reservoir with water that must be emptied on a regular basis. We recommend for a crawl space dehumidifier that you choose one with a pump because it’s very easy to forget to empty something you don’t see very often. Well, this size is great if you are looking to reduce the amount of humidity in any room that’s range is medium to large. The 50-pint dehumidifier is also great to help get rid of those nasty side effects that come with high humidity areas such as mildew and mold. Specifically, the smell of mildew can be enough to make me nauseous and having mold and mildew in your house can also create some health issues. They’re also a breeding ground for bacteria! Dehumidifiers can combat all of that negativity by reducing the humidity that causes these problems and also cleaning the air in the process to help prevent any illness. These points make it an ideal crawl space and basement dehumidifier! It’s also great for any space where you’re keeping a lot of your valuables stored. High humidity levels can damage wood and make metal rust, ruining that table that’s been in your family forever or that coin collection that you’ve been waiting to cash in. The 50-pint dehumidifier is perfect for these situations as it can quickly and effectively eliminate the excess moisture while leaving your items in their proper condition. Some dehumidifiers of this size can cost as much as the larger ones but, because of how common they are, you can usually get a very good deal on them. Also, the best 50-pint dehumidifiers weigh less and can even use less energy! In the four years that we’ve been working on this list, we have tried out around 15 dehumidifiers and tested them all thoroughly. To make it into our review, a dehumidifier must have a top-ranking performance and a smooth-running system. If the performance of a product is poor then value, ratings, conditions, and the features are almost useless. This is quite possibly the most important factor, and every product on our list performs well. The best 50-pint dehumidifiers must also be affordable because cost is another very important aspect that we considered in our review. We’ve all got money issues in one way or another. Why add to that stress by spending more than you need on a dehumidifier? We measured which of the tested products gives you the most bang for your buck. Pumps, reservoirs, and draining systems were also important factors that we tested. Each of these have their pros and cons, which we have carefully considered in our top rankings. For instance, a feature that makes the product easier to use is nice, but if that feature doesn’t work or if it is missing another feature then it may not be worth it. How often and how quickly positive reviews come in are another important factor we took into account. We know that the opinions of other consumers are a very important factor when deciding which dehumidifier best suits your individual needs. How a dehumidifier works in different situations is an important factor to consider. Nobody wants a dehumidifier with amazing features that can’t withstand the extreme conditions of a basement. Over the span of two months, we used each of these in several different environments. We carefully checked the indoor temperature of each room that we placed the dehumidifiers in. We compared humidity levels before and after using them, checked each of their respective capacities, and paid mind to how easy or difficult they were to maintain and clean. We placed them in basements, bedrooms, and crawl spaces. We used some with and without pumps and tested which dehumidifiers were the most user friendly. With these factors in mind, we chose the best 50-pint dehumidifiers, which you can see in our ranking below. In our ranking, we considered 28 different features for each of the selected products. The report we compiled is open for anyone to view but we just ask that you like any of our social media pages in exchange for viewing it. We put a lot of effort into our review process and hope that we can assist you in what can be a difficult decision making process. If one just Googles the word “dehumidifier” or “best dehumidifier” they’ll end up with tens of thousands of results all pointing them in different directions. Some reviews will hold contradictory statements about products and consumers are left to try out a dehumidifier that may not be as good as they had read or hoped. We worked hard to make this list as easy to navigate and understand for you as possible. We tried several dehumidifiers out and know that some are just plain better than others; that’s why we have this list of our top five products. These are the best dehumidifiers that we tested and we gained a lot of knowledge about how they work in the process; knowledge that we are giving to you for free to make your lives (hopefully) a bit easier. Flying off the shelves, this $200 unit never needs to stop working. Continuous Drain feature allows emptying without shutting down and Energy Star means you'll never want to. Why is this pick our number 1 choice? The Frigidaire 50-pint dehumidifier with effortless humidity control is a wonderful piece of equipment. Throughout our own tests, it was the dehumidifier that we were most consistently impressed by time and time again. We cannot stress how great of a product this is and you’re about to see why as I explore it’s features in greater detail. We chose the Frigidaire 50-Pint Dehumidifier with Effortless Humidity Control because it is the most efficient and convenient of the dehumidifiers. It sports a nice design and is a fairly affordable choice with a $200 price range. It is Energy Star certified, has a very convenient continuous drain feature, and uses less energy than most of its competitors. It can also function at very cold temperatures, making it a wonderful option for use as a crawl space dehumidifier. In addition to these reasons, it is also one of the most highly reviewed dehumidifiers on the market today. In fact, it received about 30 ratings in just a matter of 3 days and has thousands of top level ratings! 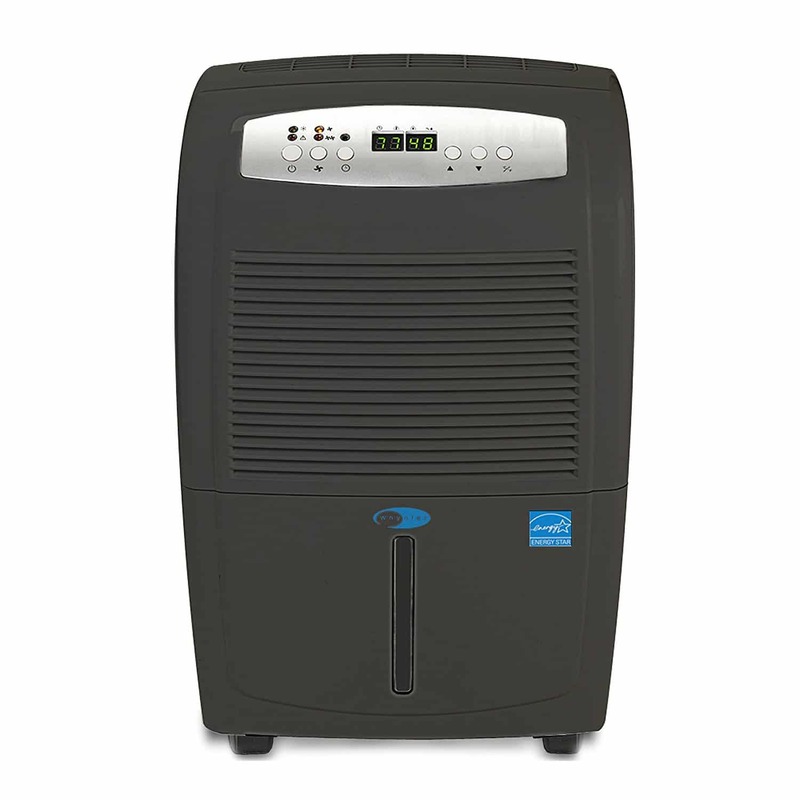 This is our top pick and it holds the proverbial throne of best dehumidifier with ease. I remember when we first tried this dehumidifier out it was already turning heads. This wasn’t the first one we tried out but it quickly became our first choice in terms of quality. The performance is second-to-none which is why it’s our number 1 pick. It cleans the air as it reduces the humidity levels. This dehumidifier is a reliably running product that looks good doing it and that’s what a dehumidifier is supposed to do. This product maintains an affordable price for consumers. 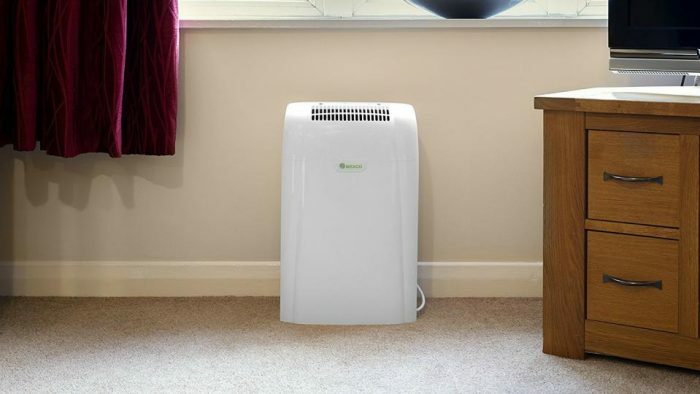 With everything that comes with it, the amount that you’re getting with this dehumidifier for the price is a bargain that simply can’t be beat. Speaking of what comes with this dehumidifier, let’s talk about its many great features. The humidity control of the humidifier is, well, effortless. It is Energy Star certified which means it has been verified to use the least amount of energy. For you, less energy means more money (or less money wasted on your electric bills) and it’s even better for the environment. It also has a highly desired continuous drain feature that just makes life and cleanup easier. This product has thousands of positive reviews and maintains a rating between 4 and 5 stars. This is a great product and virtually every consumer review written about it is glowing. Nothing can stop this dehumidifier and it can be placed virtually anywhere and will still work the same. This can be a problem with some of the cheaper models which freeze when it gets too cold or malfunction when it’s too hot. Thankfully, this product is both remarkably effective and affordable. If you need a dehumidifier, you must consider this one. This is a must buy for anyone who wants the whole package. It has a low cost, an easy to operate system, and is very effective. It is great as a crawl space dehumidifier, for basements, bedrooms, and pretty much anywhere. With fully programmable interface and many automatic features this 3000sf Keystone model is a shockingly low $165. Armed with Turbo but yet Energy Star, it won't break the bank. Why is this pick our budget pick? This is a wonderful dehumidifier for the savvy buyer who wants an effective but affordable dehumidifier. It is fitted with great features and wonderful performance wrapped in a cheap price which is what makes it the best budget pick. LED screen, feature memory, and automatic shutdown are all examples of the great features that come with this pick. 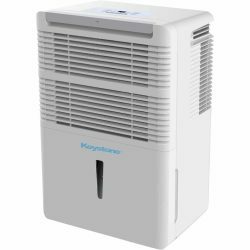 The Keystone KSTAD50B Energy Star Dehumidifier is a great choice for anyone that wants a good dehumidifier, but is on a strict budget. This is a phenomenally smooth running dehumidifier especially for the price that it’s at. We were impressed with how well it ran for us when we tested it out and it never showed any apparent wear and tear even after continued use. This unit is easy to clean which is a convenience not found with most other budget dehumidifiers. It has an automatic shutdown and restart option and can save settings even when the power goes out. It has an LED screen with electronic controls and a 24-hour timer that is not often found in dehumidifiers of this price range. This dehumidifier has rave reviews for what it is: a very affordable product that has more features than one would expect. Most of the negative things people said had to do with the reservoir capacity, but most agreed it was a great value for the price. It can be used in all of the conditions that you’d need to put a dehumidifier in. Yet, it’s best suited for indoor use because it has low reservoir capacity. We also recommend purchasing a pump so that it can be utilized to its full potential. This has the best cost out of all our reviewed dehumidifiers and has innovative system features not often found in this price range. Simple for the technologically stagnant, this Arctic Aire unit performs many tasks without input so the beginning user can stop worrying if they forgot something. Why is this pick best for the beginner? Many people who aren’t familiar with dehumidifiers or aren’t very good with technology may want a different kind of option. 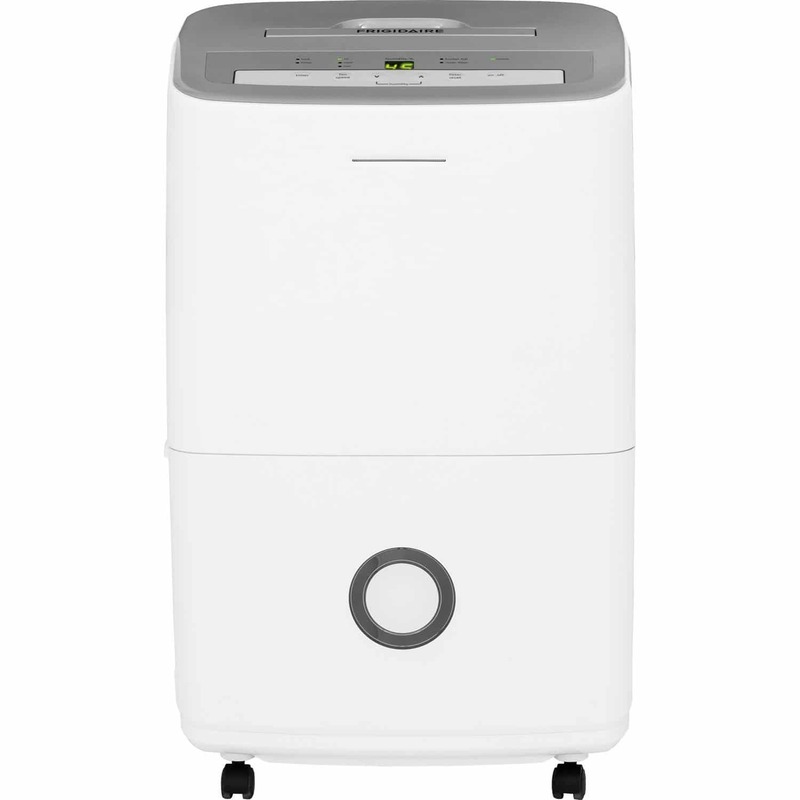 The Arctic Aire ADR50B1G 50-pint dehumidifier is a fantastic dehumidifier for anyone seeking a quick and easy setup. The technologically disinclined won’t have to fear hours of frustration with this dehumidifier, just less humidity and more peace of mind. Great features, ease of use, and great ratings make this our best for beginners pick. 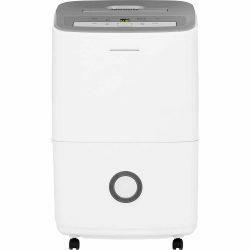 This dehumidifier is great and it’s not a bad price for its ease of use. Yet, it is a bit more costly than some of the other models on the list and doesn’t have as many features. This is a good running product to be sure. Its hardware is reliable and you can count on it to keep running for a long time. The Arctic Aire ADR50B1G 50 Pint Dehumidifier is the easiest to operate out of all the dehumidifiers that we tested. 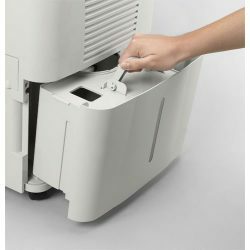 It is very easy to clean because of its removable air filter. It’s a breeze to program, and has one of the quietest fans. A quiet fan makes it a spectacular choice for indoor use. The direct drain system allows it to operate continuously which means less work for the user! This unit can function at very low temperatures due to its automatic deicing feature. This makes it a great choice to put anywhere which is a great convenience to the buyer. This also is a good indicator of its durability which makes it a great buy. This dehumidifier holds an average of about 4.4 stars out of 5 which is a really high score. Unfortunately, there aren’t nearly as many reviews for this product compared to some of the others so it’s not as popular. With a system that is the most user-friendly that we have come across, this is the best dehumidifier for beginners. At under 200 bucks this Energy Star unit by Frigidaire will just keep on sucking the air dry as long as you keep it drained. Its tank fills fast not for size but for effectiveness. This is another great product that has some wonderful features that we thoroughly enjoyed. It also has some flaws that just barely kept it out of our top three recommendations. Its price is under $200 which makes this model another affordable option. If you haven’t learned by now, we really like it when something is good AND cheap. So, a good product that keeps itself under a couple hundred dollars is a fantastic bargain. It has a great humidity control option that quickly and efficiently controls the amount of humidity by percentage in the room that it’s in. It has an automatic shut-off option and a great tank. Unfortunately, even though it has the option for continuous operation, this model requires that it be very close to a drain which can make for an inconvenience. This is especially true because this model can’t be used with an extension cord which further limits where you can you place it. On a positive note, it is Energy Star certified which, as we stated above, means it uses less energy. This product has a great four out of five stars with over ten thousand votes! Despite this, it is not as highly reviewed as some of the other dehumidifiers on our list. Some reviewers complained about its durability and others thought it was too noisy. Also, some of the negative reviews mentioned the problems we listed above. Can be used in extreme conditions if necessary but since it requires a drain to be close by, this can make it difficult to use in a crawlspace. This is especially true because it can’t even be plugged in using an extension cord. This dehumidifier is low-cost but has a few inconveniences that make it hard to recommend for everyone. Extra long hose, built-in wheels, auto-defrost, and armed with a pump this Whynter wonder is exceptionally portable and potent. At just over $200 it won't freeze your budget. This product is a bit pricey at over $200. 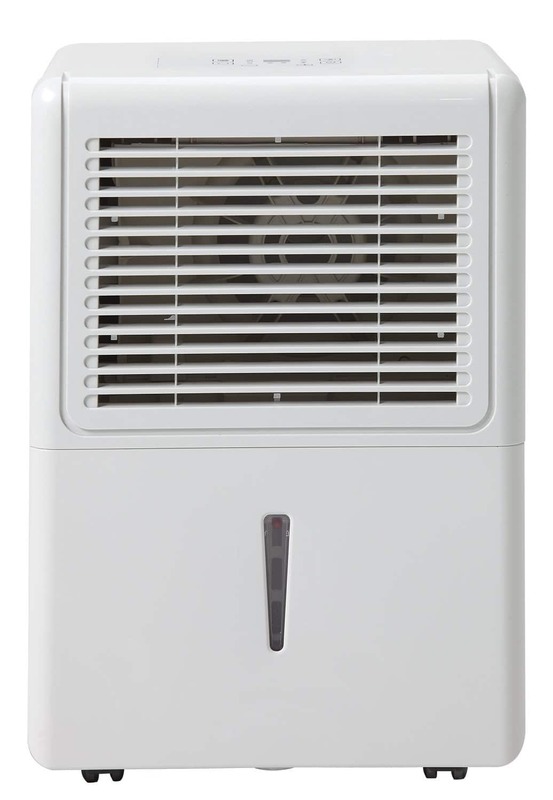 We tried to keep our picks within a price range that this one exceeds by a bit, but it is still a great dehumidifier. This product makes it onto our list because of how portable it is. It utilizes a longer hose which makes for an easier installation. It even has handles and wheels so you can move it with ease. This unit has an automatic defrost capability which makes it great for even the coldest of locations. These are some pretty amazing features that get overshadowed by the price. It also has that nice Energy Star rating. This dehumidifier has thousands of consumer reviews and fall between a 3.2 and 4.0 rating (out of 5). This is pretty good, but considerably lower than all of the other models listed. Some complained about its durability (despite it being portable, some claimed that the wheels break easily) but most of the complaints stated that they felt its cost was more than it needed to be. Because of its portability, you can place this dehumidifier anywhere at any time with great ease. It can withstand very cold environments and comes with a pump so it can be put to great use as a crawl space dehumidifier. Easy installation and portability make this a good choice but its cost is higher than most which makes it harder to afford when put up against some of the other options. On this list, we have compiled the five best products and our reasoning for where they rank in our review. We certainly recommend the top three dehumidifiers on this list because of their numerous features, their excellent price, or their ease of use. However, any one of the five are great products in their own right and your choice will depend on your individual needs. Finally, for a more in-depth look into each of the products, we highly recommend the free report we created that will surely be an asset when making your decision. We hope that this review has been enlightening for you and that you’ll take our word when it comes to purchasing a dehumidifier. Not many reviewers provide so much information for free but we really care about our readers. We are shoppers too, and when we make a purchase we want to get opinions that are both informed and trustworthy. We hope that that’s what we have been to you and we’d love to hear from you regarding the dehumidifier that you purchase. Let us know what model you purchased, why you purchased it, and how it worked for you. Once again please like our Facebook page and follow us on our social media websites and click the free report if you need more information regarding your purchase.